“Solange: An Ode To” which is “an interdisciplinary performance piece” at the Guggenheim Museum on May 18. 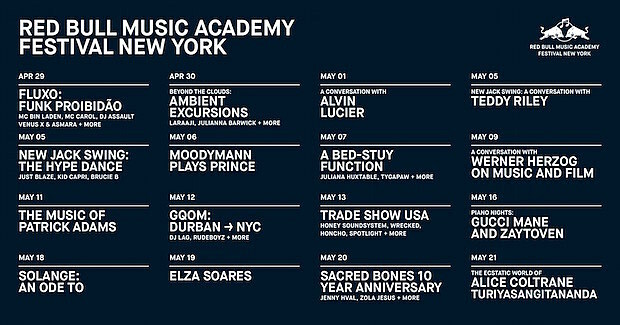 A Sacred Bones 10th anniversary show with Jenny Hval, Zola Jesus, Rose McDowall, Blanck Mass, The Men, Moon Duo with Jim Jarmusch, Marissa Nadler, Psychic Ills, Uniform and more TBA at Greenpoint Terminal on May 20. “Werner Herzog on Music & Film” happening at The Metropolitan Museum of Art on May 9. “Moodyman Plays Prince” where the house music legend pays tribute to his hero at 637 W. 50th St on May 6. Juliana Huxtable will host “A Bed Stuy Function” at Sugarhill Supper Club on May 7 with Tygapaw, Bearcat, Papi Juice, FXWRK and stud1nt (KUNQ).